This is the calm before the storm and I can’t wait! I hope everyone has a save and Happy New Year! Well its the technically the middle of the week but since I’ve taken Friday off work, it feels more like a Thursday, in fact I keep thinking it is Thursday. But, I’m very happy that it is only Wednesday because we have a party scheduled this Friday and I have lots to do. Frozen pears and apple slices to make the punch bowl look festive and stay cold. Here is a short tutorial from Bon Appetit, if you’re interested, “How to Make an Ice Mold”. My apple slices ended up looking a little strange since I don’t have an apple corer but hopefully that will not affect it too badly. 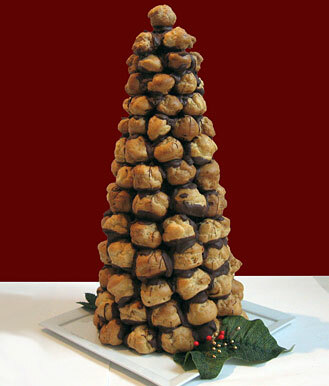 In case you’re wondering, a croquembouche is a giant tower of cream puffs held together with caramel. This is my first attempt at this fancy French dessert, but luckily I can make the cream puffs tonight. I guess its time to get to work! I’m baaack! I’m sure you were all wondering what happened to me and the 12 days of cocktails. I have no excuses except to say that last week got really busy, really fast and I found myself in the middle of a cooking and baking marathon on top of all the rest of the last minute wrapping and shopping not to mention a work business trip and doing actual work for my steady and paying job. Somehow the blog was pushed back to place #25 in the midst of all that. For those of you who checked back each day only to be disappointed with the same old blog post, I’m sorry but thanks for checking back! I can’t express how grateful I am for dedicated readers. Today, I’ll give you 3 last cocktail recipes that hopefully you can use this weekend for New Years! And give you a small update on our Christmas party which is scheduled for Friday. Yup, 4 days away and getting less each second. Combine all ingredients except the sugar, brandy, raisins and nuts in a heavy saucepan and heat slowly. When the wine mixture is hot, place a rack on top of the saucepan so that it covers half of it. Arrange the sugar cubes on the rack, warm the brandy, pour it over the sugar and set it aflame. Ladle the wine mixture over the flaming sugar until sugar is dissolved. Serve in 8-ounce mugs, garnished with the almonds and raisins. Mix rye, vermouth, and bitters in a cocktail shaker. Add 2 large ice cubes. Stir to blend, then strain into a coupe glass. Garnish with a cherry or an orange peel. The 12th and final cocktail recipe is the punch that I will be making for our party this Friday. I got it from December’s Bon Appetit Magazine, The Long Hello. It looks like great flavors and I’m even going to attempt to make the ice ring that sits in it. I hope this will last us all night. Make and freeze ring mold with pears and apples according to our ice mold directions. DO AHEAD: Ring mold can be made 1 week ahead. Cover and keep frozen. Stir Calvados, St-Germain, bitters, and 1 cup water in a punch bowl. Add ice ring, then Champagne. Ladle punch into glasses and grate nutmeg over. There you have it 12 new cocktail recipes, just in time for New Years! I hope you can find one or two new ones to try. You don’t have to go out to get a good cocktail! Speaking of going out or…staying in…I’m in full party planning mode. With 4 days till our big bash, I’m feeling the heat. Last night, I was making lists and pulling recipes and trying to eliminate complicated recipes. I tend to bite off more than I can chew with parties so I’m making an effort not to go overboard and kill myself this week. Tomorrow I’ll fill you in on my menu choices. Oh and cleaning of the house has to be worked into the schedule, too but I think Eric will be helping a lot with that one. I’m sure he can’t wait. Sorry for the delay in these two cocktails, I was on a business trip and thought I’d have time to write up some posts, but didn’t. So I’m cramming 2 in to this post. I’m also planning to bake some more cookies this afternoon. This will be my first attempt at gingerbread men! Fingers crossed that things go well. I’ll update you on that tomorrow. And speaking of gingerbread, that is the inspiration for the next cocktail! This recipe will take some time but it will taste just like gingerbread! For the syrup: In a small saucepan over medium heat, combine the water, sugar, ginger, cinnamon, and cloves. Bring to a boil, then reduce the heat and simmer for 5 minutes, stirring occasionally, until the sugar has dissolved. Remove the pan from the heat and allow the syrup to cool, about 20 minutes. Remove and discard the ginger, cinnamon, and cloves. For the espresso: In an 8-ounce glass measuring cup, whisk together the boiling water, espresso powder, and liqueur, if using, until the powder is dissolved. Set aside to cool. Combine 1 cup syrup with the espresso/hazelnut liqueur mixture in a large martini shaker. Add the Kaluha and shake to combine. Pour over ice-filled glasses and serve. This next cocktail is beautiful and simple not to mention delicious, but then what champagne cocktail isn’t delicious? It combines the iconic flavors of strawberries and champagne. Add the orange-flavored liqueur, honey and strawberries to a food processor and process until smooth. Fill the chilled glasses halfway with the strawberry mixture and then fill the rest of the glass with Champagne. If you enjoy fruit flavored martinis then look no further. This pear martini is sure to knock your socks off. The combination of pear and St. Germain in this drink makes for a match made in heaven. St. Germain calls is the Pear Tree Martini but I edited the name to reflect the season. This drink is perfect for a night in with the girls or a night on the town. I make this recipe often and always have these ingredients on hand. This drink is a no-fail, I promise! The picture and recipe are from St. Germain. METHOD: Shake all ingredients with ice and strain into a chilled Martini glass. Garnish with a slice of D’Anjou and a sprinkle of cinnamon or nutmeg. We’ve made it, 1 week ’till Christmas! I spent my afternoon in front of Home Alone 2 wrapping gifts for under our tree. Things are starting to look very festive indeed! I missed Friday’s post so I’m packing alot of cocktails into this one! We’re making up for the last few days. These cocktail recipes are sure to spice up this week before Christmas, whether you find yourself in need of an after work cocktail with a friend or you’re hosting a family gathering or a party all of these recipes are winners. Beat the egg yolks well until they turn light in color, adding 1/2 cup of the sugar as you beat. Add the milk, cream, and liquor. Then beat the egg whites with the remaining sugar until they peak. Fold the whites into the mixture. Grate the fresh nutmeg over the drink. Place 1 tablespoon Cointreau and 1 1/2 teaspoons cranberry juice concentrate in each of 8 Champagne flutes. Top with Champagne. Drop 1 cranberry into each cocktail and serve. Shake bourbon, sweet vermouth, and dry vermouth with ice in a cocktail shaker. Serve in a Martini glass with a spice-sugared rim (mix sugar with ground allspice and nutmeg). Garnish with orange peel. Hope these cocktail will liven up the end of your weekend! Look out for more good cocktail ideas tomorrow as we continue our 12 days of cocktails! Here’s a recipe for a drink that will warm up the coldest days and make your holiday cheery and bright! I love the cocktail itself, but I also love the name; it rolls right off the tongue. I always imagine myself drinking hot toddies by a warm fire after spending the day skiing on a beautiful mountain and instead of horrible- ski- hat-head, my hair looks amazing as a laugh hysterically at my handsome-husband seated next to me, also drinking a hot toddy. How do you imagine drinking your hot toddy? Ok, back to the drink. The hot toddy is made up mostly of whiskey (it can also be made with bourbon), but when you combine that with hot water, lemon, sugar and nutmeg, well it’s delicious! You can even add some star anise to make it look pretty or cinnamon sticks, depending on what you prefer. Combine the lemon, sugar, and water in a small, 2 to 3-quart slow cooker set to high. Cover and heat, stirring occasionally, until the sugar dissolves completely, 20 to 30 minutes. Add the Scotch whiskey and stir to combine. Reduce the heat to low and serve warm with lemon slices and freshly grated nutmeg. My obsession with St. Germain liquor is no secret here. (Read more about it in this post.) I love the stuff! This cocktail is a recipe I used last year at our Christmas party for a “punch” and it was a BIG hit. I kept having to make more and I was making it by the pitcher! It’s really simple and deliciously light and sweet, plus kind of beautiful because of all the fruit. This is not a traditional sangria that will take time to make, you can whip it up easily for any party or if unexpected guests show up at your door. I love that you can make a whole pitcher and save the time it would take to make individual cocktails. To make, simply combine all the ingredients from the recipe and stir. Add in fresh fruit and keep serve cold. It’s officially 12 days until Christmas, you better get those halls decked, packages sent, cards stamped and cookies baked. There is no more time to procrastinate. In honor of these last 12 festive days, Red Velvet is going to feature a new cocktail recipe each day. I hope that these recipes will help to make family time a little more bearable, and keep those cheeks warm and rosy this holiday season. The first cocktail I’m going to highlight is one that Eric and I discovered in Germany a few Christmases ago. We were enjoying a bustling Christmas market in the town of Speyer which smelled of bratwurst and baked goods. We noticed that lots of people were holding ceramic mugs filled with something hot. I could see that it was not hot chocolate and immediately wanted to find out what it was. 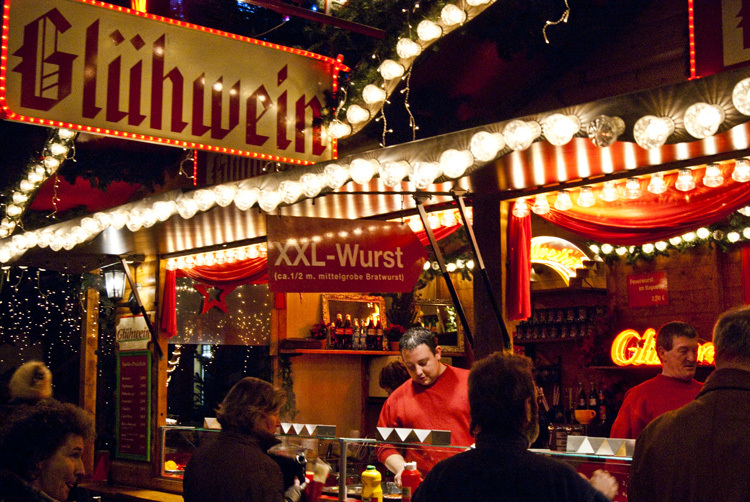 We quickly learned that it was a hot spiced wine called Gluhwein, see the sign below. We did not get any at the Christmas Market but were able to order some at a restaurant later in the trip. It was served nice and warm and with sugar packets. 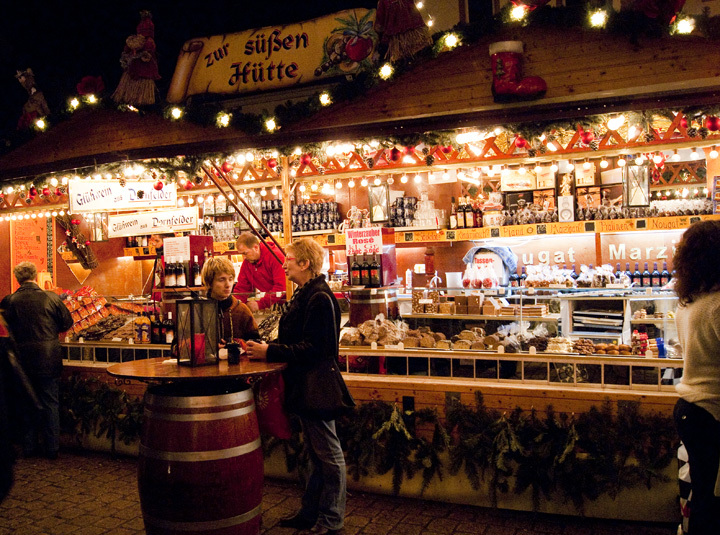 Eric and I both loved it and upon returning, I set out to find my very own gluhwein recipe. The great thing about this recipe is that you can use any cheap red wine. The spices you add will contribute more flavor to make the wine taste great. 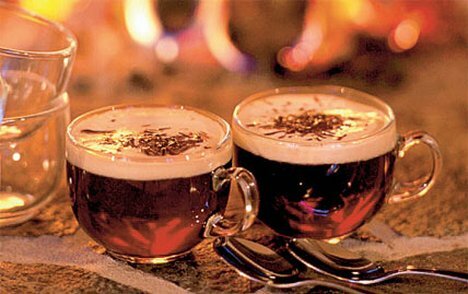 I also love the idea of an alternative to hot cider. Simply combine all the ingredients in a saucepan and heat on low until just simmering and allow to steep for about an hour before drinking. Combine all in a medium saucepan over medium-low heat until just simmering, but do not allow to boil. Steep at that temperature for about an hour. Serve in small mugs, straining out the ingredients. As women, I think it’s safe to say that if you choose to drink alcohol you’ve probably heard of Lindeman’s Framboise beer. It’s the sweet raspberry beer that is usually served in a pretty glass and is in fact pink. It’s one of those stereotypical “girl” beers and for good reason, many women really do enjoy it! But something most people fail to realize is that Lindeman’s makes other flavors of this tasty lambic. Apple, peach, cassis and kriek (cherry) are also flavors of this popular elixir. 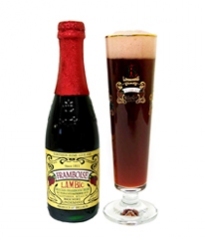 Eric and I are big fanatics of all things cherry, you can read about that in this post or this post, so when he spotted a cherry lambic while purchasing some other beer, he couldn’t pass up the chance to try it. He poured it into two glasses at home and the color was so pretty and Christmasy, being so red. Once you pick up the glass to drink, you smell a sweet and very cherry aroma but the beer itself is not overpoweringly sweet. I find the raspberry one to be just a little too sweet for me to drink a whole lot of it, but the cherry was a nice balance. 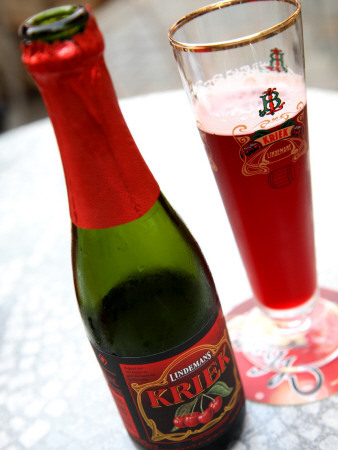 If you’re a fan of cherries and looking for a drink that embodies Christmas Spirit, look no further than Lindeman’s Kriek. It will not disappoint! Speaking of Christmas Spirit, can you believe its less than 2 weeks till Christmas?! Yep, I freaking out a bit this morning considering I haven’t even purchased cards to send out or wrapping paper, or finished shopping, but I did finally finish decorating the outside of the house! Hopefully Santa won’t miss it now. How are your holiday plans coming, anyone else feel like Christmas has snuck up on them this year?